Adewale Akinnuoye-Agbaje is a fairly easy to recognize actor. 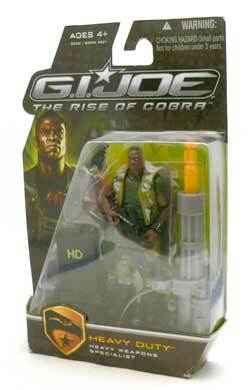 In GI Joe: Rise of Cobra, he portrayed Heavy Duty, a heavy weapons specialist for the Joe team. The odd thing is he used his natural accent, which we never really get to hear from him. A number of fans, including me, we puzzled by the choice of Heavy Duty over Roadblock. Roadblock has a bit bigger fan contingent and is more widely recognized. 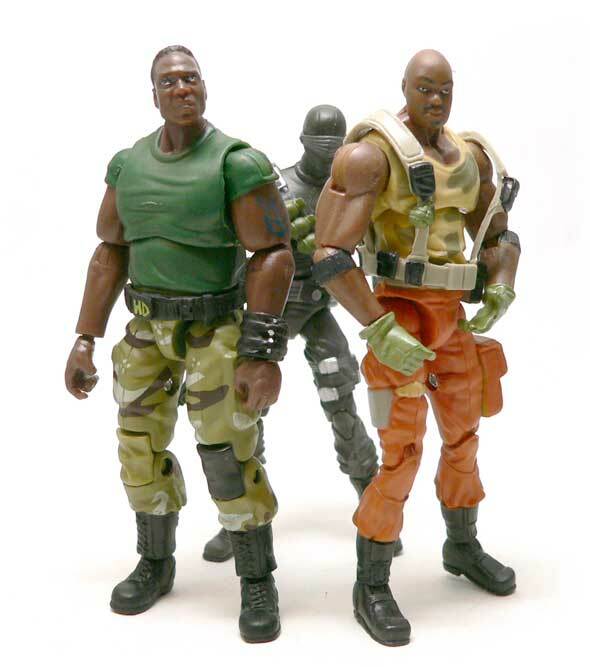 I’m sure the casual GI Joe watcher may have confused the two. Errex had previously reviewed Mr. Echo, I mean Heavy Duty in his Reactive Impact Armor. This version is more of the standard soldier look for him. 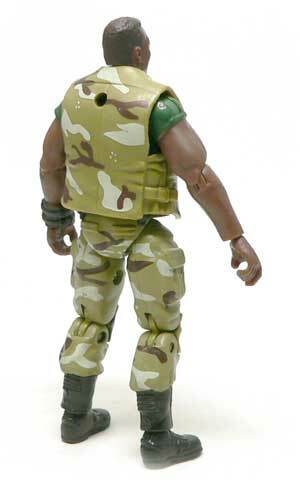 Oddly, this camo version differs from most of the Rise of Cobra Joes in that it’s green instead of the blue grey of most of the team. One thing about Heavy Duty, like the actor, he’s big. While it would be easy to just pop his head on a generic body, that’s not what they did here. He’s taller and broader that most of the other figures in the series. 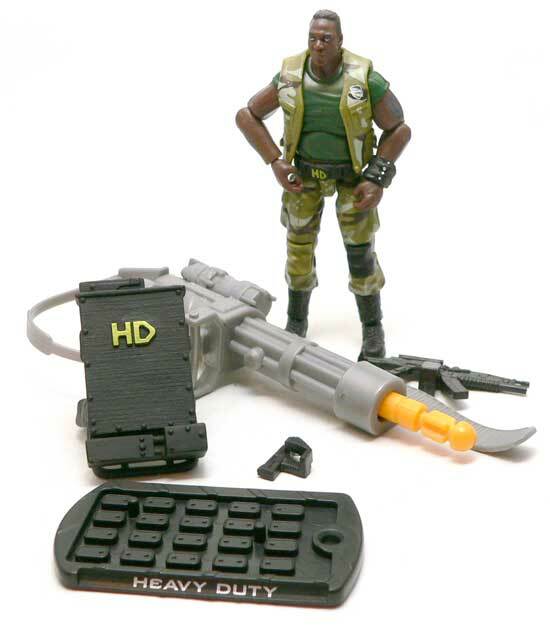 I strongly suspect that Hasbro predicted that Heavy Duty was going to be a bigger hit with fans than he was. I don’t remember him having a big belt buckle with “HD” on it in the film, I could be wrong. This HD and the prominence of the one on the back pack make me think that the marketing machine was trying to really play up his role. As much of the promotional material he was featured in, I really expected him to play a bigger part in the film. His legs are well done camo with black combat boots. It doesn’t get much more soldier like than that. The one oddity is the black left knee piece. Because the piece is black, it looks like a big square black patch on his knee. The figure would have looked better if this was green. If both knees had been black it would have looked like some sort of reinforcement for kneeling. Kind of like Toughskin jeans. The vest isn’t quite the tactical vests that dominates modern soldier figures. It’s more like a sleeveless jacket. 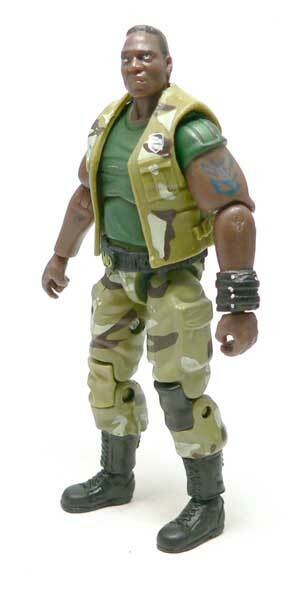 The camo matches up to the pants fairly well, and the GI Joe eagle logo is over the left breast pocket. Under the vest is a darker green t-shirt that is busting at the seams. Obviously, this isn’t a loose fitting garment. I can appreciate the way his chest has been modeled. It isn’t that anatomy text book muscle style as sculptors are sometimes prone to doing for larger heroes. It looks like they are trying to represent a big guy in a realistic way. The t-shirt continues on the arms perfectly. The left arm is also adorned with some extra detailing. There is a tattoo below the shirt sleeve. I’m not sure how film accurate it is, but it’s done well enough. There’s also a wrap around the left wrist that the character had in the film. I’m sure this is some sort of wrist support for heavy weapon duty. Other than those details, HD is bare armed. In this scale, bare limbs are always a trade off between look and articulation. This figure is no exception. When there is no cloth wrinkles and folds to hide joints under, they tend to look really obvious to me. To me the wrist joints here make the handslook like they were just stuck on the ends of the arms. The left also hangs has a slight gap to it. The likeness on this figure isn’t bad. However, the paint on the eyes doesn’t help it. While not nearly the ToyFare eyes we saw on the Indiana Jones figures, they are painted a bit odd here. They almost appear to be looking up. Which is odd, because there aren’t any people that he wont’ have to look down to. They also give the face a slightly vacant expression that would be more appropriate for Adewale’s Adabisi from Oz. As a heavy weapons specialist, you know Heavy Duty is going to come with some big guns. Unfortunately, I was hoping for something a bit smaller and realistic. 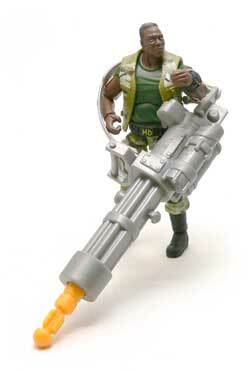 For the action gimmick with this figure they included a missile launching Gatling gun. Which is the right weapon, just really oversized. This gun would look much better with a six inch figure. I couldn’t figure out a way to even get him to old it in any sort of pose. He also doesn’t come with the smaller version the Reactive Impact Armor figure did, so you don’t get a good BFG to go with him. 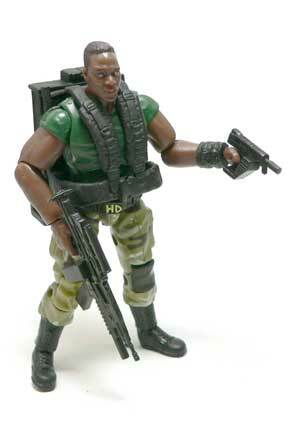 This figure shares the backpack and ammo belt from the other figure. The pack is okay. The straps are sculpted to look padded but end up looking a little oversize. Also, I couldn’t get the pack to fit well without taking off his vest. It might be possible, just way more work than I was going to do. There are two other guns in HD’s arsenal. A pistol that looks like some sort of GI Joe version of Biker Scout pistol. There is no holster to store it in, so I’m not sure what I’m going to do with it. There’s also an assault rifle that looks rather fictional. One cool detail is that it appears to have some sort of brass collecting box be tween the trigger and the clip. I have to say I prefer this look over the armored version. It’s just fits better with all of my other GI Joe stuff. The green camo is cool and the likeness isn’t bad except for the eyes. The biggest letdown is the oversize gimmick gun. In short, a good character figure that could be great if you have something in your armory box to arm him with. I’ve got a Rock & Roll Machine gun from an accessory pack he will probably be displayed with. I seriously debated getting the armored one just for the gun, but the price went back up before I could.